Colorado potato beetles (CPB) overwinter as adults in the soil and will have 2 or 3 generations in a growing season. The first generation tends to be the one of greatest concern for growers as they can cause a significant amount of damage to young transplants. Tomatoes planted near fields that had potatoes, eggplants or tomatoes in the previous year are at the greatest risk. 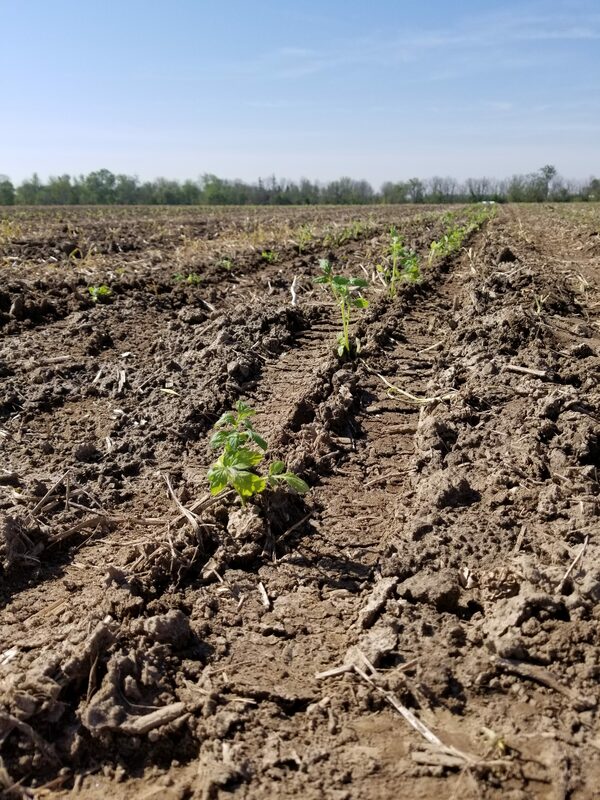 Scouting for CPB should begin shortly after transplanting. Examine whole plants, looking for egg masses, adults and larva. Early season threshold for CPB is 0.5 adults or larva per plant within the first two weeks of transplanting. Currently, it is common practice to use Admire* in-furrow at planting to control early season CPB. However, with the re-evaluation of this and other group 4A products, like Actara* (same active also in Minecto Duo*) and Assail*, by the Pest Management Regulatory Agency (PMRA), uses and use patterns are likely to change and it is important to start thinking of other options. There are several products available for CPB control, though the beetle is known to be resistant to several of them, including group 1A, 1B and 3A insecticides. Some foliar products that are still expected to have efficacy against CPB include Sivanto Prime, Success or Entrust, Coragen, Exirel, Minecto Pro and Harvanta. Timing of foliar insecticide applications to target young larva is essential to good control and relies heavily on crop scouting. CPB egg mass on underside of tomato leaf. Young CPB larva on a tomato transplant. Wireworms can be problem, more so in cool, wet springs, when they can remain in the root zone for a longer period of time. They tend to be more of an issue on sandier soil and cause damage by cutting portions of the plants roots and stem underground. Scouting for wireworms can start as early as mid-April by placing two baiting stations in the field at high-action sites, such as sandy knolls or in heavy grass infestations. To create a baiting station, dig a hole approximately 15 cm wide and 5-8 cm deep. Bury a nylon mesh bag containing 1 cup of untreated, soaked corn and wheat mixture or 1 cup of freshly cut potatoes. Be sure to mound the soil over the baiting station to prevent standing water and mark the location with a coloured flag. A few days before planting, dig up the bags and record the number of larvae found at each station. Most wireworm species take 2-5 years to complete their development, so identifying problem fields early and implementing control strategies prior to crop planting is important. Orthene* can be used as a transplant water treatment prior to planting, but there are no products registered for wireworm control on tomatoes once plants are in the ground. Always read labels carefully before using any pest control products. * products contain at least one active ingredient currently under re-evaluation by the PMRA. Uses and use patterns may change upon completion.